16th January 2019 | filed under Aesthetic Treatments, Chin, Face, Non-Surgical, Surgical. Gaining weight over winter is extremely common, especially during December and over the festive period. For a lot of people, weight gain is more noticeable in the face and, in particular, the chin area. The dreaded ‘double chin’ is nothing more than a build-up of excess fat and loose skin under the chin, but it can cause self-consciousness in both men and women. This procedure is a fantastic solution for anyone who wants to go about their day without worrying about having to go under the knife – or about having to spend a lot of time out of their busy day to get treated. Ultracel HIFU takes less than an hour and requires no downtime; it tightens and lifts the skin on the neck, under the chin and the jawline (not to mention the brow, around the eyes, décolletage and body). The procedure seeks to create tighter, firmer and plumper skin, and also boosts the creation of new, more elastic collagen over time. Using a combination of high-intensity HIFU and radiofrequency, Ultracel lifts the skin as well as the deep muscle layer underneath, which previously could only be reached through surgery. Not only will you see an improvement in the appearance of your chin, but your skin will also be more elastic and brighter. Skin tightening procedures have evolved greatly in the past few years, with non-surgical treatments such as Thermage CPT being an incredibly popular option. Instead of having surgery to improve skin laxity and the appearance of wrinkles, patients prefer to tighten the skin without the need for anaesthetic or downtime. Thermage CPT is a radiofrequency skin tightening procedure that boosts collagen and rejuvenates the face. The result is improved skin elasticity and smoothed-out fine lines and wrinkles. The treatment only works on the lower dermis, so it won’t damage the integrity of your skin with its cooling action; you’ll find the procedure is simple and comfortable, as well. If you’re looking to get rid of your festive double chin, Thermage will help you to regain tighter and firmer skin immediately after the treatment. Excess fat and an undefined jawline are a common issue shared by many people. Skin becomes lax and saggy and the subcutaneous fat under the chin starts weighing down, something that can be caused by things like hormonal changes and imbalances, side effects to medication, weight gain or age. For stubborn fat that simply doesn’t want to go away, not even with diet or exercise, chin liposuction might be the solution for you. This is a proven method with long-lasting results that work by extracting fat from localised pockets; we use a specially designed tip that allows for precision and accuracy, so we can target the problem area without conflicting with or compromising the surrounding tissue. This remodels and contours the treated area. Should you prefer a shorter treatment time and less downtime, Vaser may be the answer for you. This relatively quick treatment sculpts and tightens the chin area for the best results. Over time, the platysma, the muscle of the neck, becomes weaker and creates lines and wrinkles at the front and sides of the neck. 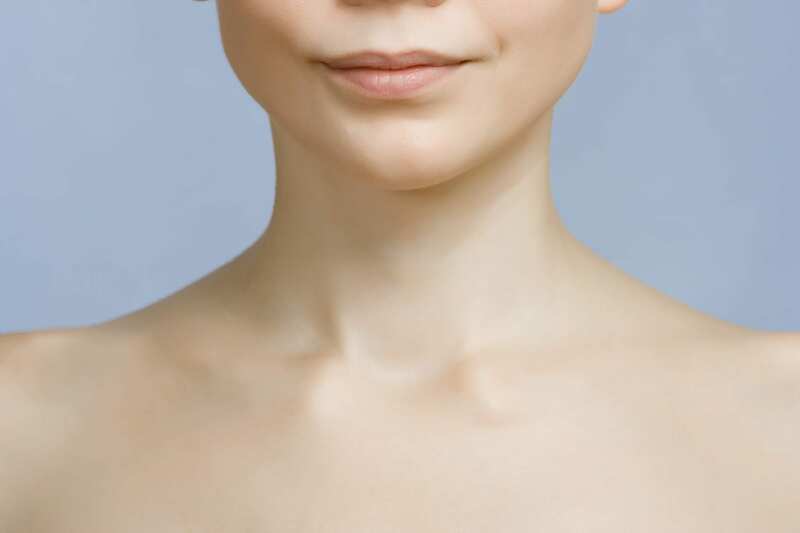 The loosening of the supporting ligaments, which attach facial skin and soft tissue to the jaw, can lead to jowls, while the addition of extra fat and skin leads to the hated double chin – signs of ageing that can be combated with a neck lift, or lower rhytidectomy. This surgical procedure reduces the visible signs of ageing in the neck and lower facial areas, like the jawline. A double chin, or even drooping skin under the chin, can be improved dramatically with this treatment, since it gives you a younger and fresher look. 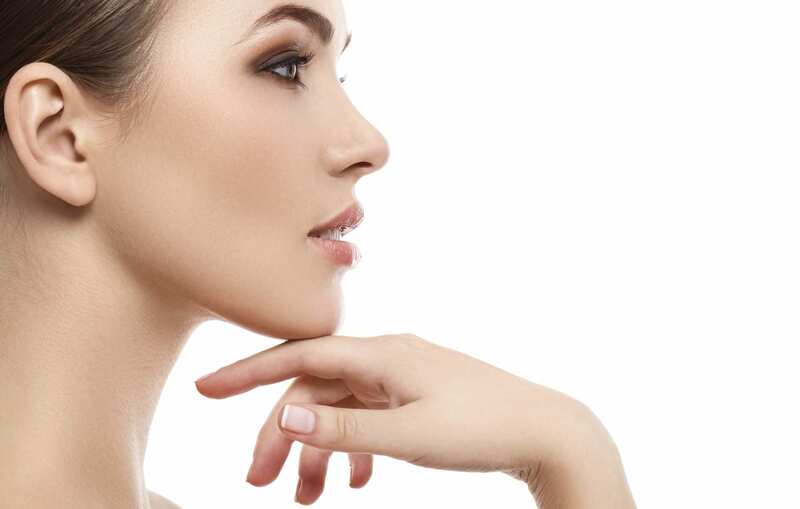 A neck lift involves the same incisions as a facelift, usually behind and in front of the ear, as well as underneath the chin in the natural skin crease. The final results tend to come in around the six or nine-month mark; however, they are also long-lasting, so you won’t have to worry about repeating the procedure for a very long time. For neck lift surgery in Jersey or neck lift surgery in Guernsey, pay us a visit or get in touch to learn more. At The Aesthetic Skin Clinic, we want to help you get rid of that double chin you hate and regain your usual confidence. Let us know if you have any questions about how we can help you; our professional team is more than happy to answer any queries about our surgical and non-surgical chin procedures, as well as our other aesthetic treatments.